You've come to the right place! My company is the most experienced and qualified to increase your bottom line when you sell your house. We are specialists in assisting you as you make the necessary preparations to place your house on the open market. Owner of Enhanced by Lance, LLC, Mobile, Alabama's Premier Home Staging Company, and Official ASP Course Trainer for StagedHomes.com, my training and experience allows me to understand your timeframe and budget and facilitate your best return on investment. Check out our website for all our service packages. We help you sell faster! Staging Works! 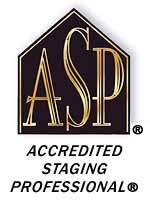 Statistics show that an ASP Staged home can generate additional buyer interest, maximizing the selling price and/or selling it in the least amount of time. This is Teresa's goal for YOUR home. She combines experience culminated with a strong sense of professionalism to get the job done. Call today without delay for an appointment at 256-714-5902. Spiffy is a full-service home staging business. We perform total home transformations to attract the right buyer who will be willing to pay top-dollar for your home. And, we guarantee your home will sell faster than average! Maximize your profit and minimize your time spent on the market with Spiffy Staging and Design services. I'm Carol A. Emlich-Bates. I have been in the service business for over 30 years. With my experince as a business owner and now a realtor and ASP, I am confident I can exceed your expecatiions and get you top dollar for your home, and help you find a new home. You can reach me at 256-872-0395 or 256-249-0914.